Expanded access to EVs would help Oregon's consumers, economy, and climate. Electric vehicles (EVs) offer important advantages over conventional gasoline-powered cars, including less-expensive fueling and maintenance costs, and significantly fewer global warming emissions. In Oregon—home to more than 5,000 electric cars and hundreds of public recharging locations—EVs are already saving drivers more than $3 million in fueling costs. In 2014, driving the average new gasoline vehicle 100 miles cost Oregon’s drivers around $12.16; driving the same distance on electricity cost an average of only $3.41. Click to enlarge. These figures assume a 28.7 miles per gallon (mpg) gasoline vehicle—the projected average mpg for 2014 model year cars as reported by the Environmental Protection Agency—and an electric car with an efficiency of 0.30 kilowatt-hours per mile, such as a 2014 Nissan Leaf. Fuel prices are 2014 averages for West Coast (minus California) gasoline and residential electricity in Oregon, as reported by the Energy Information Administration. Oregon’s EVs also offer significant climate benefits. Because electricity in Oregon is a cleaner energy source than gasoline or diesel, EVs can help cut emissions from the transportation sector, which accounts for about one-third of Oregon’s total global warming emissions. Based on Oregon’s electricity mix, an average battery-electric EV charged in the state will result in global warming emissions comparable to a gas-powered vehicle getting 75 miles per gallon. 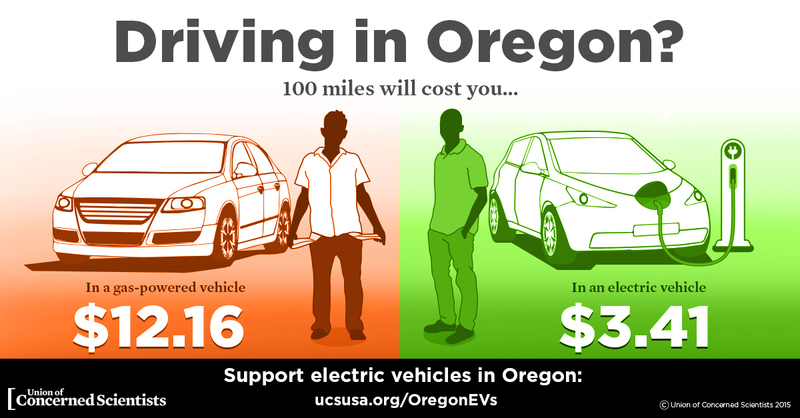 As Oregon continues to transition to cleaner sources of electricity, the climate advantages of EVs will only increase. Smart, progressive policies are needed to establish Oregon as a clean vehicles leader. Policies that reduce the up-front cost of electric cars, increase access to home and workplace charging, and incentivize the use of clean fuels will help ensure EVs continue to spread—saving money, reducing pollution, and cutting oil use.